Where to Store your Crypto? How Do You Trade In Bitcoin and Crypto? What is Bitcoin and Crypto Mining? What is a Crypto Fork? Cryptocurrency trading robots exist to make the crypto trading process easier. Currently, we have a number of cryptocurrency trading bots available in the market. One such bot is CryptoHopper. CryptoHopper enables traders of all levels to make the most of their trading opportunities. In return, they maximize profits and minimize losses. CryptoHopper’s primary goal is to empower traders by providing an easy to use and fully featured service. The platform supports multiple cryptocurrencies while eliminating human frailties from their trading process. Note that CryptoHopper does not guarantee profits. However, the service helps traders make the right trading decisions based on algorithmically programmed trading approaches and external signals. You can also configure it and use the best cryptocurrencies for day trading. To set up an account with CryptoHopper, you need to visit the website and enter your email address, name, username, and a strong password. Ensure you confirm your email address. You will have access to a wizard that helps you set up and configure your account. You will then choose an exchange and configure the bot through the preferred trading API keys. CryptoHopper supports Kraken, Poloniex, Binance, Bittrex and, Gdax exchanges. To aid you through this process, CryptoHopper has tutorials on every step of the setup. At this point, your account is ready for use. You will also access a number of features on the dashboard. Furthermore, with CryptoHopper, you can also sign up to Signallers. The signaller service is courtesy of advanced traders who are on the lookout for positive signs. Note that signallers are both free and paid. Signallers have easily accessible performance reports and their profitability can be tracked. Note that with signals, you need to be aware if it is short-term or long term. If you are not sure, it advisable to close them quickly. To keep an eye on technical indicators, they use cloud computing and machine learning algorithms. You can combine both buy signals and technical analysis indicators at the same time. With CryptoHopper, we have three pricing plans on top of the free seven-day trial dubbed the Explorer plan. For the free trial, all you need is to sign up and start using the service. Upon expiry of the period, the CryptoHopper services are automatically disabled. Users can get access to indicators like Stoch, RSI, Bollinger Bands and MACD. We have the Explorer Hopper Starter package that goes for $19 months per month. It has 80 positions, with a maximum of 15 selected coins. The package comes with two maximum triggers. The running time is after every 10 minutes. Additionally, subscribers of this package get basic support. The next level is the Adventure Hopper Medium which goes for $49 per month. It has 200 positions with a maximum of 50 coins. This package has five triggers with a running time of five minutes. Additionally, subscribers get extended support. Lastly, we have the Hero Hopper Pro which goes for $99 per month. It comes with 500 positions with maximum selected coins standing at 75. This package has a maximum of 10 triggers with a running time after every two minutes. It also comes with arbitrage and first line support. Note that CryptoHopper does not offer any refunds and users should make the most of the free trial before committing to a subscription. In terms of payment, CryptoHopper accepts payment from PayPal, major debit and credit card, bank wires, cryptos like Bitcoin among other services. CryptoHopper runs a web-based solution with an intuitive user interface with numerous functions. The platform allows users to configure the bot to trade automatically and make use of both algorithmic and social trading. 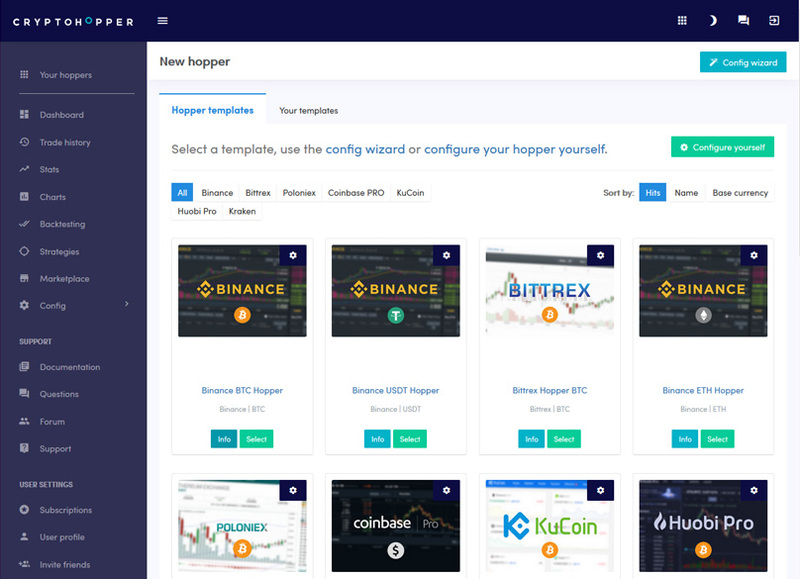 Furthermore, CryptoHopper has different trading tools and incorporates features such as a bot backtesting tool, configurable and saveable templates, trailing stops, and customizable technical indicators. CryptoHopper services are also accessible on desktop, laptop, tablet, or mobile phone. The platform has also been designed to be easy to use and doesn’t require any professional programming experience or advanced technical knowledge. Unlike Most trading bots, CryptoHopper has some unique features that make it friendly for new beginners. The platform has the Hopper Academy available to all members. Furthermore, the platform has a video library that explains how it operates. Furthermore, the developers have managed to set up a vibrant community which is useful to new members. We also have the Discord and Telegram groups that are very active. The platform supports English French, Spanish, Dutch, and Portuguese. This is the real question when it comes to using CryptoHopper. Based on the features available, users can make high profits but sometimes we have cases where one can be scrambling to make profits. However, if the trading strategies that are formed using this platform are applied to a slow and low-risk market, then you can generate profits. Keep in mind that the cryptocurrency market is very volatile and using the CryptoHopper trading bot or any other bot is risky. If you have previous experience in trading, you will be able to form better strategies. However, if you are a beginner, you are in store for a long term investment into the learning process before you make substantial profits. You can expect between 1% to 10% in profits on a typical trade. We have limited information about CryptoHopper’s developers. However, the company is registered in Holland. The platform has a number of security measures in place. The bots have no withdrawal rights, and in the event of a hack or data breach, nefarious actors would not be able to directly access funds. The team has also developed working relationships with leading exchanges. It also uses two-factor authentication (2FA) in order to secure accounts. Completely cloud-based. The platform stores its data in the cloud, hence there is no risk of losses. Furthermore, users can access data anywhere. Detailed analysis. The bot has one of the best technical analysis with the various indicators integrated within it. Beginner friendly. CryptoHopper caters to the needs of newcomers as well, providing a platform to handle all the technicality of trading. Lack of owner information. There is no information regarding the creators of CryptoHopper. This avoids accountability and is a major setback since many users are not able to form a trust. Pricing. CryptoHopper is providing normal technical indicators and integrating signals in automation but the pricing is high. To get the full potential of this bot, you will have to pay $99 every month. The amount is high considering the returns you get. There is a lot of hype around CryptoHopper. The hype is worth it considering the features put in place. The combination of technical indicators and third-party trading experts provides traders with increased options as do the template and backtesting features. Furthermore, the platform is worth trying since it caters for both new and advanced traders and incorporates a number of features that all its members can look to benefit from. me recognise in order that I may just subscribe. Thanks. Crypto Mak is a blog about cryptocurrency. Bringing you the latest news on Blockchain, trading, mining and everything crypto related. DISCLAIMER: The content provided is for general information and educational use only. We do not provide financial advice and you should not rely on the information provided to make any decision regarding cryptocurrency. © 2019 copyright by Crypto Mak. All rights reserved - This website may reference affiliate programs which pay commissions from referrals made through the links.